I must say that this is my first bonsai, so I thought that I would go with a free local variety from a friends garden. 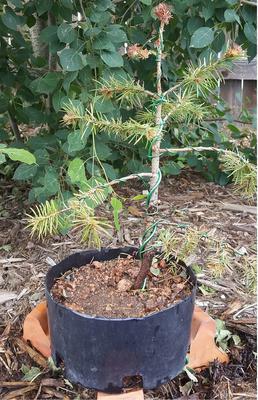 I chose a Colorado Blue Spruce, partly because I just really like this tree and because it was free. I decided to just cut the planter pot down to make a bonsai pot, since after reading several articles I noticed that the pot is irrelevant for this stage. I am having problems with growth, could this be just from cutting the tap root and shock from replanting and shaping? I know it is not the prettiest tree but I'm working on it.